This is my guide to say no for busy people such as busy professionals, entrepreneurs, and coaches. The principles apply to anyone who wants to say no. Do you hate to say no? Are you always trying to be nice to others at the expense of yourself? Well, you’re not alone. I used to hate to say “no” because I didn’t want to hurt the other person’s feelings. For example, whenever I got requests for help, I would tend to them even though I had important work to do. Sometimes the requests would take 2-3 hours each; sometimes longer. It was common for me to sleep late to catch up on work. I’m talking about as late as 4-5 am, sometimes even sleeping at 8am. Yes, it was that insane. Over time though, I realized that saying yes came with a set of consequences. Every time I said yes, I would set aside time and mental energy which would be taken away from my existing needs. While okay when dealing with a small number of requests, as my site traffic exploded and my clientele increased, I became weighed down with a never-ending stream of requests. Navigate today’s overly connected world where people expect you to always be there to accept every single request. Not requests relating to you, but requests relating to them. Create your personal space. People do not know what’s on your agenda. Unless you learn to say no, they can only act based on what they want, which is what they want for their goals. Saying no is about setting your boundaries so people know what your priorities are. Achieve fulfillment and happiness. When you say no, you control your time. You control what goes into your days. And you get back to being in the driver’s seat of your happiness. To say “No”, first understand why you resist it. Here are common reasons why people find it hard to say no. Do these apply to you? Afraid of being rude. I was brought up thinking that saying “no,” especially to people who are more senior, is rude. This thinking is common in Asia where face-saving is important. Face-saving means not making others look bad. Wanting to be agreeable. You don’t want to alienate yourself from the group because you’re not in agreement. So you conform to others’ requests. Again, this is especially so in Asian societies where group conformity is heavily valued. Fear of conflict. You are afraid the person might get angry if you reject him/her. This may lead to an ugly confrontation. Not burning bridges. Some people take “no” as a sign of rejection. They feel dissent which leads to a frayed relationship later on. Fear of lost opportunities. You are worried that saying no means closing doors. You want to help. Deep down you really want to help the person. You don’t want to turn them away, even if it may eat into your time. Yet when you dig into each reason, you will find little basis for it. Why do I say that? Saying no doesn’t mean that you are being rude. It also doesn’t mean being disagreeable. It’s silly to resist saying no just to conform. We can’t conform to everyone on everything or we’ll become no more than an average, always mirroring what others tell us. Saying no doesn’t mean creating conflict — it’s just asserting your needs and boundaries. People who severe ties just because you say no probably aren’t very solid friends to begin with. Saying no also doesn’t mean a loss of opportunity. It’s more important to say yes to the right things and the right opportunities rather than saying yes to everything. Last but not least, while you may want to help others, there are costs to be factored in — the other things on your agenda, the other people you have to help, the things you want to do, etc. Ultimately, saying no is your right and your prerogative. Every “yes” comes with its costs — the time, energy, and commitment to honor the request. This cost may be small for each yes, but little trickles of yes’es over a long time will eventually create a huge deviation from your goal. And it all boils down to this: What are your goals? How important are they to you? And will saying yes to random requests take you closer or further away from them? It doesn’t mean that you start rejecting everything that doesn’t fit your goals, but it means that you need to be more conscious in how you live your life and the things you allow to enter your space, time. Understanding that if you want to create a life of your own, you need to control the things that you do in your daily schedule. 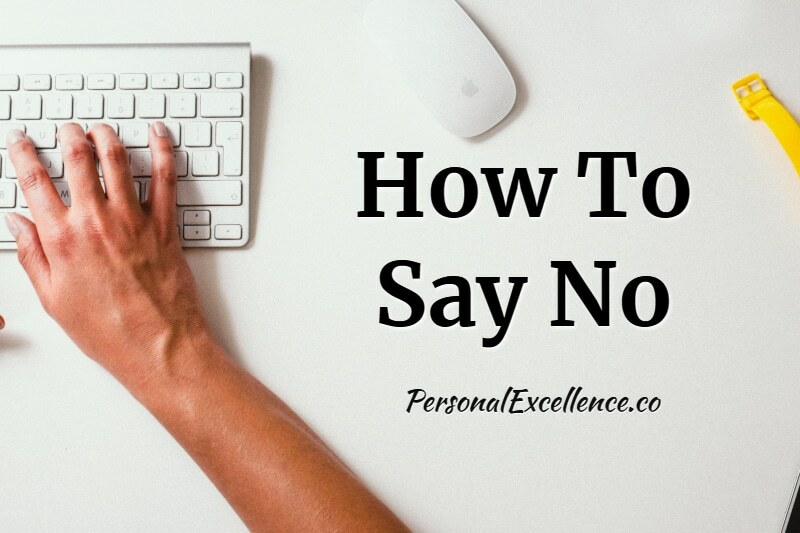 Saying no is a fine art that depends on the situation and who you’re dealing with. There is no perfect way to say no and you can’t control how the person will feel, but it doesn’t change the fact that you need to do it. You need to say no sometimes, many times if you are a busy person. Here are my tips for you. If you want to reject the person, just do so. Thank them for their invite but let them know that you can’t take it on due to other circumstances. Don’t over-think or over-complicate it, because the more you think about it — and I’m referring to requests that you already want to reject — the more it takes up your mind space and time. There’s no need to over-explain if it’s not relevant; you also run the risk of the person replying with a lengthy response to try to change your stance, when all you’re trying to communicate is a “No, thank you.” Just communicate what’s needed, and move on. One way to ease the “pain” of rejection for the other person is to offer alternatives. This is especially so if the person is hinging everything on their request to you. If I get a speaking request that I’m not a match for, but I know someone who will be a good fit, I’ll pass the contact along. If I get a coaching request that’s out of my scope, but I know helplines that can help, I’ll point them that way. If I know someone else who can assist the person, then I’ll loop them in with their permission. This is optional and done out of goodwill. You don’t have to do it just because someone is asking something from you; you only do it if you happen to have a good suggestion. One thing I struggled with before was the constant requests for meetups. While I’m excited to meet with each person, the problem is that there are too many requests to realistically do so. The Dunbar’s number is very true, which says that humans can comfortably maintain 150 stable relationships—and that’s for communities with a very high incentive to remain together, like in a village or in a company branch. In today’s world where people are dispersed (meaning more effort needed to coordinate, meet, etc. ), the number is smaller. At a certain point you overload because the effort to have a close personal relationship takes a sizable amount of emotional energy, along with implicit wants and expectations, and being required to do so for every connection will quickly drain your ability to get anything done. What I do is I give a mini-yes if I can’t take the request but I want to help in some way. I let them know that I’m not able to do X, but I’m able to do Y which is a much reduced, lower involvement step that I can offer. This means instead of meeting up, offer to help via email. Instead of committing headfirst into a project, help on the side. Instead of accepting an invite to join a board, which comes with commitments and responsibilities, to give advice on an ad-hoc basis, as and when you can afford to. This is great when dealing with high-pressure salesmen, or if you are too bogged down to think properly at the moment. This gives you time and space to think about it rather than feeling pressurized to decide on the spot. Sometimes you may well decide that this is not for you after having the space to think about it. Deferring also gives you time to come up with a proper rejection, if all the person is doing is rebutting you rather than accepting that you don’t want it. If you get repeated requests of a certain category and they are becoming a drain, assess if they are a fit with your goals. If not, consider rejecting the entire category. When you look at each request individually, it isn’t a problem and you do want to be involved. But when you have a network of a thousand of people, essentially the odds are that someone will be in town every week or there’ll be a request to Skype/email to chat/discuss something on someone’s agenda every few days, that’s outside of your list of to-dos. This quickly drains your time and it’s difficult to get anything done when you’re constantly switching from meet-up to work mode, from people’s agenda to your own Quadrant 2 work. Here it’s not about rejecting the person but recognizing that the request requires a commitment that you can’t offer at this moment. Anything else you do accept is the exception, not the norm. Segmenting requests by category, then dealing with it by its category helps you detach the request from the person and look at it objectively. One way to manage expectations is to use an autoresponder. An autoresponder is an automated reply that your email client sends to anyone who emails you. Most email clients today have this option in the form of an “Out of Office” or an “Auto-Reply” feature. You can type an autoresponder that tackles the general requests, so that 90% of those who contact you can get the answer right away. “Hi, thanks for your message! Due to a high volume of messages, I’m not able to respond to each email individually. Please don’t be offended as it is true for even my close friends. 2) If you’d like an interview, I’m currently only doing interviews with platforms with >X reach. If this applies to your publication, please reach me at [link to media page]. 3) If you’re requesting for meetups, I’m currently tied with other projects and won’t be able to tend to any meetups. For other requests, please go to [link to contact page with other instructions]. You can also check out other email autoresponder ideas here. An autoresponder works best if (a) you get a high volume of unsolicited mail, such as people you don’t know trying to ask for help, or (b) most of your emails are not related to your core work. I don’t recommend it if you are just receiving internal company mail or mail directly related to your work. Back in my corporate job, I noticed that the vice president and directors would have a secretary. The VPs would have a dedicated secretary while the directors of each department would have a shared secretary with others. Each secretary would help their boss with admin stuff, like handling their emails, calendar, and calls. At that time I didn’t understand why they would need that. I mean, can’t they just multi-task and practice better time management? After I started my business and as my business became established, I began to understand why. When you are in a position where many people are trying to get to you, when you constantly receive many requests, it becomes difficult to deal with this and get high-level work done. There are little details involved with each request like logistics and coordination. Furthermore, the higher up you are, the higher the noise-to-signal ratio, meaning you get a high ratio of irrelevant or unhelpful requests to relevant and useful requests. The process of sorting, thinking, and rejecting each request becomes very exhausting over time. The problem here is “cognitive load” which is the mental energy needed to handle each request. 99.9% of people will never need an assistant, but if you get so many requests that it overwhelms you, consider getting an assistant. Weigh the pros (time saved, being able to offload your admin work, having a single-point-of-contact for all communication) vs. cons (costs, having to manage another headcount) of getting one. The great thing about having an assistant is that they serve as your gatekeeper, where they reject all requests that don’t fit you and help you decide the ones that should reach you. Something to consider if you get so many messages that it becomes a full-time job managing them. Hopefully you’ll never have to use this method, but if you ever meet people who can’t take no for an answer and who keep abusing your contact details, blocking may be the way to go. I face this with persistent marketers and overzealous networkers, an issue when you run a public site. You can easily block email addresses with modern email clients or create an email filter to delete messages from such addresses. Last but not least, not replying is also a form of reply. Running a public platform, I get too many messages to review products/services, check out new apps, meet up, get into calls, among other things. It’s not possible for me to read every single message, much less reply to everyone and have a life. So I’ve learned to only reply to what I can while letting go of the rest. This is outside of emails relating to my core work like my coaching and work clients — I revert to every single one of such emails as they are my priority messages. Of course, here I’m referring to messages that are outside of your work responsibilities and close personal relationships. If you have a commitment to someone/something, then you should be reachable and accountable.